If you haven’t already seen our guide to identifying clicks from your email marketing campaigns, then please go to that page first to ensure that clickers from your email marketing campaigns are being tracked within your A1WebStats data. This guide helps you to identify those website visitors who clicked through from an email marketing campaign and who looked at several pages of your website. If, for example, you had 100 clicks and 20 of them went to several pages, including your product or service pages, after clicking through to your website, then you’d probably want to invest more time/resources in nurturing those people that are more interested in what you have to offer. Select the date range after which you sent out your email campaign and then click on Referrers from the main navigation bar to identify clicks from your email campaign in the list of referrers, as you can see in the example below. 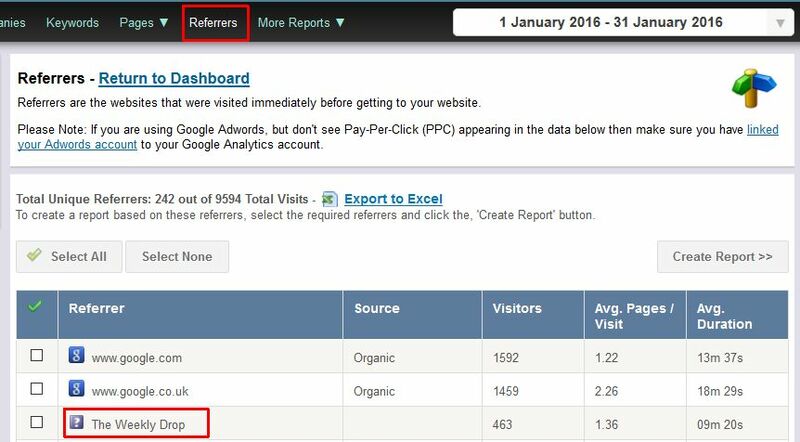 If you can’t see your email campaign in Referrers then you need to ensure that your campaign clicks are being tracked within your A1WebStats data, as detailed on this page. 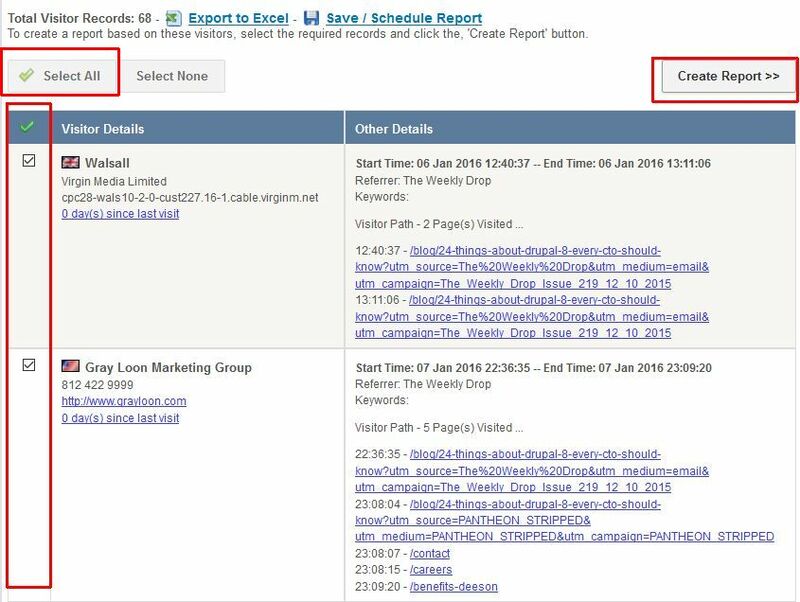 You need to tick the box next to the email campaign, having identified it within the Referrers view, and then click on ‘Create Report’. You will now see every person who clicked through from that email campaign. If you have previously used ‘Edit Details’ then you’ll see who they are. Otherwise you’ll need to refer back to the date/time of the click via your email marketing system in order to link them up. If the numbers of clicks aren’t huge you could manually scroll through the people who clicked through to your landing page(s) from your email campaign. You will be able to identify those who looked at more than the landing page – these are the people you’re probably most interested in. The example below shows someone who looked at more than the landing page. What you’ll notice in the above example is that there was nothing identifiable about the person who clicked (as their IP address hadn’t been linked to them/their business). 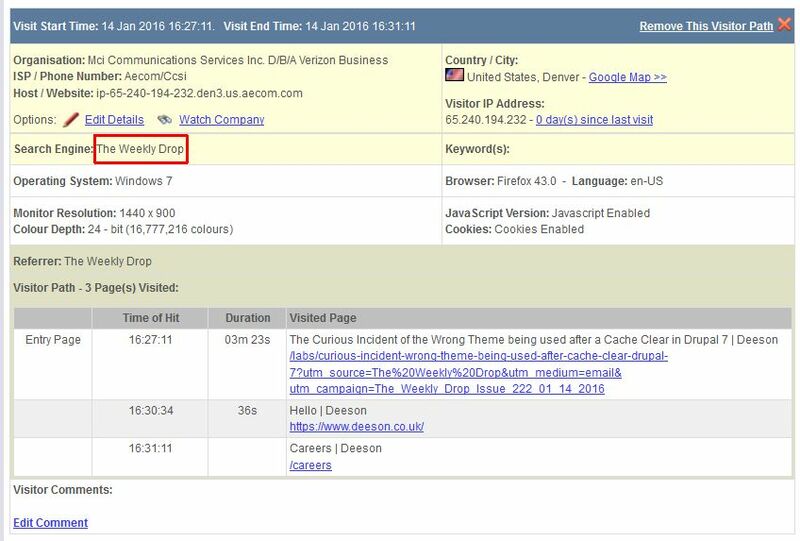 In this case, knowing that the currently anonymous person has looked at important website pages (which is potentially a buying signal), you would then go back to your email marketing system to identify who clicked through at that time and date. When you have that information you would decide how to then nurture that person. 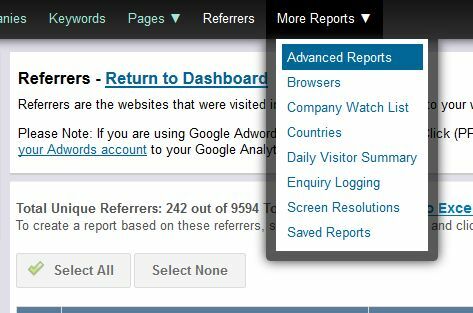 If you have a lot of clicks from emails and quickly want to identify only those who looked at more than the landing page (or you want to identify people who looked at specific pages after landing) then you can use Advanced Reports. First select your date range of interest (for example, from the date that you sent out the email campaign through to the current date). Then select the Advanced Reports page from the More Reports menu option. 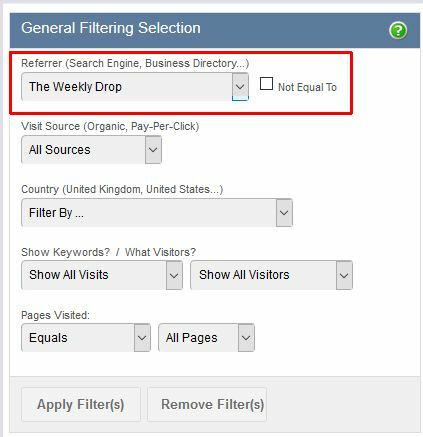 From the Referrer pulldown within the General Filtering Selection, select the email campaign. 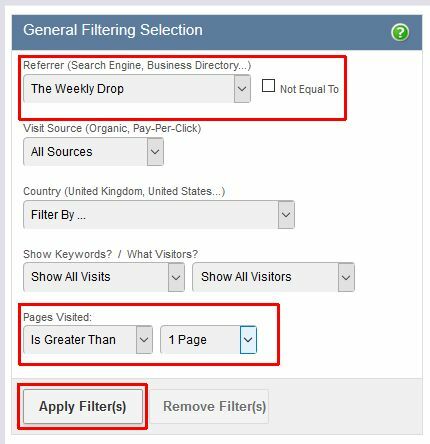 Next change the Pages Visited pulldowns to be ‘Is Greater Than’ and ‘1 page’ and then click on ‘Apply Filters(s)’. This will display all those email clickers who went to more than one page (in a summary view). You can then click the ‘Select All’ button to highlight them all, followed by ‘Create Report’ to see the detail view of each of those people who clicked and looked at more than the one page they landed on. You can then review the data and decide upon the next steps in nurturing those email marketing clickers who went to more than the page they landed on. You can also use the Advanced Reports to identify clickers who got to a certain page. You do this by going through the previous steps but adding in reference to that page url of interest within the ‘Visited Page Options’ part of the page, and specifically the ‘Any Visited Page 1’ box. 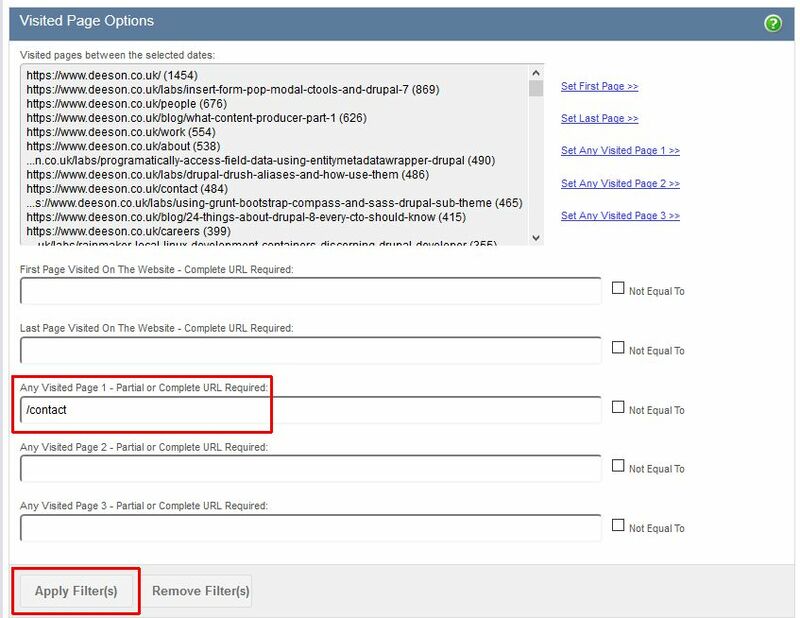 In the example below, clicking on ‘Apply Filter(s)’ will then create data for the email campaign recipients who got to the /contact page as part of their journey through the website.